Visiting the dentist can be nerve-wracking sometimes, but it also can be a source of pride and accomplishment when you hear the words, “your teeth look great — no cavities!” Scheduling regular (6-month) checkups and cleanings gives you the ideal opportunity to (hopefully) hear the good news and pat yourself on the back. And, knowing that your checkup is scheduled provides extra incentive for you to remain diligent about your home oral care routine. 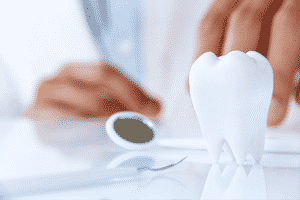 Even if Dr. Cain’s verdict isn’t that clean bill of oral health that you desire, and your dental checkup uncovers problems, the sooner problems are detected the better. Early detection enables the dentist to intervene before a more serious problem develops. A cavity discovered early can mean the difference between a quick dental filling instead of a more involved root canal. A dental checkup is pretty straightforward. You will relax in the dental chair and, if you would like, enjoy a program on our in-room TV. Dr. Cain will use a small, hand-held explorer tool and mirror to closely evaluate your teeth and gums. He will be looking for decay, weaknesses, inflammation, or other abnormalities. What he sees during this examination, combined with what he sees on x-ray views of your mouth, will tell him if you need any restorative work (such as having cavities filled.) If you do, he will advise you to make a follow-up appointment for the necessary work. If you don’t, he will congratulate you and advise to come back for another checkup in 6 months. The second part of your routine visit will consist of a professional cleaning conducted by one of our skilled hygienists. Using professional tools, such as an ultrasonic scaler that cleans your teeth with high frequency vibrations, the hygienist is able to remove built-up plaque and tartar that cannot be removed via at-home brushing and flossing. You’ll leave our office with a fresh mouth and smooth, shiny teeth. To schedule your next checkup and cleaning appointment, contact Healthy Smiles in Gary, IN, by calling 219-938-2637, or by emailing our office at info@healthysmilesnwi.com. We also proudly serve the residents of Gary, Miller, Miller Beach, and all surrounding communities.